Some shows were in rerun mode for the holiday weekend. ABC: FRESH OFF THE BOAT held at 0.7, and SPEECHLESS was up 0.1 to 0.6. 20/20 gained 0.2 to 0.8. CBS: MACGYVER rose 0.1 to 0.8, while HAWAII 5-0 lost 0.1 to 0.8. A rerun BLUE BLOODS ended the night at 0.6. 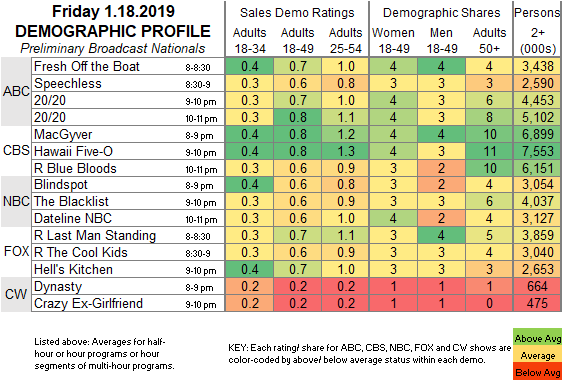 NBC: BLINDSPOT, THE BLACKLIST and DATELINE were all steady at 0.6. CW: DYNASTY was up 0.1 from its December 21 airing to 0.2, and CRAZY EX-GIRLFRIEND climbed 0.1 to 0.2. FOX: After rerun sitcomes at 0.7/0.6, HELL’S KITCHEN dropped 0.1 to 0.7. Tonight, HBO airs the original film BREXIT, and the first SNL of 2019 is hosted by Rachel Brosnahan, with musical guests Greta Van Fleet. On Sunday, broadcast will be dominated by CBS’s AFC CHAMPIONSHIP game, but it’s a busy night on pay cable, with series or season premieres for Showtime’s BLACK MONDAY and SMILF (along with the midseason premiere of SHAMELESS), and HBO’s CRASHING and HIGH MAINTENANCE. CABLE RATINGS: Come back TUESDAY for detailed demographic ratings for top cable programs from this day, later than usual due to the MLK holiday.